At The View Admin 2011 when I was presenting my Quickr session, (will post slides shortly) and asked how many people new about this subject and only 1 hand int he room went up. And he was from Europe so I figured I should remind everyone about this. 1) Backup your own sites or any user that needs to get a new laptop. Ever try to manually add dozens or hundreds of sites? Enough said. 2) Does your company supply prebuilt laptop images? And you probably need to keep these updated too. Probably many more reasons to use it but here are the links to using it from 8.2 and 8.5. I fixed the 8.5 link. In my session I explained how to do it, then did a live export, deleted everything in my places connector then an import. It took not even 2 minutes. Any way to export a specific user's places selections when moving them to a new laptop? We have a place for each client and no two consultants are on the same subset of client accounts so a standard list of places isn't too useful. This is very useful, and I just recently found out about it (out of pure need and lots of searching ... wish I had been able to go to Admin 2011). We're deploying a new server and I am preconfiguring the choice in the Add Places dialog so users don't have to know or misspell things. Looking forward to you posting the slides! ps. your link to 8.5 is broken. Brad, thanks, Fixed the link! And link to Slides posting shortly today. David, Same premise, you run the tool against their local setup, get he file, then import it into the new pc. I did not try automating it via a script or batch file but I would think one could do it but the process is very simple. LOL@your image. 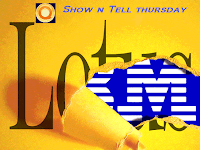 Is that the temporary IBM-is-doing-away-with-the Lotus-brand Notes image? Thanks. The IBM instructions made it seem like you had to do this on the server. I'll play with it a bit on a client machine. Hah! Had never seen that one. It's quite timely dontcha think? It could start another tempest in a teapot in our little yellow bubble ... hehehe ! David, Don't worry it is really talking about the client side. Unless I grabbed the wrong links entirely, but I just posted my slides that explain it better perhaps. Dan, nothing doing it's been posted many times all over and I have used it for posts in the past. Maybe i should come up with a new Graphic sometime.